Prepare for back-to-school with classroom decor that educates. Infographics aren’t just for online. Print them out and laminate and post in the classroom for year-long learning benefits, from science facts to good behavior tips in class. Find these and other printables at WeAreTeachers. Choose the perfect laminator for creating durable printable classroom learning tools. You know who you are. You have dropped, dunked, scraped and juggled you phone (or phones) so many times you wonder if you are worthy of cell phone ownership. Sure, you have phone cases but the issues with phone cases are nearly endless. A protective phone case that is so bulky it turns your sleek thin phone into a pocket-bulging brick. BodyGloveMobile figured out a simple solution: combine the two into a powerfully stylish, protective case that defies the clumsiest smartphone user. BodyGlove Mobile ShockSuit phone cases are engineered to withstand the roughest conditions, while staying slim. Constructed of 3 layers, a built-in screen protector, and covered buttons and ports, this case meets military drop test standards. Body Glove is confident this Military Duty phone case can handle anything life throws your way. Outer layer is a true shock absorber, converting harmful impact into cushiony diffused energy. Hard Shell inner layer is pure tough for added strength. Built in Screen Protector keeps screen scratch free. With all these layers of protection the ShockSuit still keeps its elegant figure. Open office plans may not only change our work patterns, but also the office products we use everyday. Less reliance on the cubicle means workers are no longer tied to the desktop computer. This new found freedom however, also introduces issues for office managers. How do you equip office staff who may have smaller work stations, or even no workstations at all? While the average worker had 225 square feet of space in 2010, by 2017 that figure will fall 33 percent, to 151 square feet, according to data from CoreNet Global. Laptops are designed to be slim and portable, but not necessarily comfortable. Flat keyboards and touchpads reintroduce ergonomic issues that were resolved with the proper desktop computer accessories. To help reduce wrist strain, or laptopitis, the laptop lap desk creates proper elevation of the laptop as well as providing a secure cushioned platform on which to rest it while working. Overdependence on Digital: Does Anybody Have a Pen? Sometimes moving freely throughout an open office plan with your electronic devices can mean having the entire internet at your disposal, yet not having quick access to something as simple and necessary as a pen and paper. After all, there are occasions when with tablet in one hand and phone in the other, you may desperately need to simply write down a phone number. With the new MobilePro Series, tablet accessory, you can integrate your iPad with office basics like pen, paper and business cards. So no matter where you are brainstorming in the latest upscale open office space, you can jot down notes and check your email. One of the most discussed issues of open office plans is the reduction of personal space. Though cubicle walls seem to create isolation, they also provide some personal privacy. Though the idea that open floor plans would encourage collaboration and engagement between workers seems interesting, in some cases that loss of boundaries feels like intrusion, especially when working with mobile electronic devices. Casual glances at what is on your laptop or tablet screen, or even your smartphone ,may not seem like a serious offense, but could end up making everyone a bit more guarded. Maintaining personal privacy with privacy screens can help reduce that sense of intrusion. With PrivaScreen blackout privacy filters you create peripheral blind sides that prevent prying eyes from viewing your screen. Not only for laptops, you can also get privacy filters for tablets and phones. If you need to bind documents for your business or hobby, you will discover that there are different binding types. How to choose? After all, once you invest in a binding machine you are committed to that binding type. Here are some tips to follow for deciding what type of binding works best for you. Comb binding is less expensive that other types of binding and one of the most popular ways to bind documents. It’s the right choice if you need pages in your bound document to lay flat. For example, a sales presentation that you need to lay open on a desk top to show a potential client important details. Also comb binding lets you remove or add pages. For restaurants, this is a easy way to change a menu without having to start with a brand new document. Wire binding on the other hand creates a tamper-resistant, permanently bound document. If you are creating a document that is destined to stay the same, than a wire binding machine is your best choice. Rely on wire binding for creating customized calendars, or family photo books. Wire binding is also great for creating internal office manuals that need to hold up to constant handling. Like comb, wire bound documents also display flat, making them equally useful for presentations. But wire binding is much stronger, so that lasting hold on pages ensures that the document you create will be around for awhile. If you need to produce the most professional-looking documents, thermal binding may be your best choice. Thermal, or perfect binding, produces that book-like finish, free of punch holes. This approach is great for high end presentations. If you are making annual reports or a brochure that represents your company, a thermal bound document can deliver an impactful impression. Unlike comb, the pages of thermal bound documents cannot be changed. So the document you create is permanent. Also both comb and wire offer a flat display advantage that thermal bound documents do not have. Essentially, high quality and a lasting impressive look is what will draw you to thermal binding. 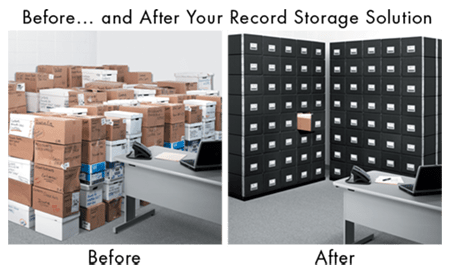 How do you decide the best records storage for your business? If you have limited storage space and require frequent access to files, Bankers Box® storage drawers would be the best choice. If you have a lot more storage space available and need to access your files less often, storage boxes are the best solution. You can stack records higher and save space. If space-saving is your primary concern, than drawers provide the best storage solution. Choosing the right type of drawer determines how high you can stack your drawers to save space, and the right size determines the size of the contents of the drawer. Maximum Space-Saving Drawers stack up to 10 drawers high. Extra Space-Saving Drawers stack up to 7 drawers high. Basic Space-Saving Drawers stack up to 2 drawers high. Letter/Legal Drawers accommodate both letter and legal size documents – This size drawer has the versatility for storing records of varied sizes. Letter size drawers accommodate letter size files. This is the perfect drawer if letter size documents are all you need to store. Legal size drawers accommodate legal sized files offering an additional three inches in width for larger record size. Whatever your drawer choice, with the stacking ability of drawers, you can maximize your record storage space, save on retrieval time and eliminate box restacking—all while maintaining easy access to all your important records. Different boxes have different purposes. Knowing which Bankers Box storage box to select, requires understanding your storage needs from type and strength, to size and assembly. String & Button boxes offer maximum security and reliable closure, even when the box is overturned. Lift-off Lid boxes allow easy access to records. Look for locking lids to securely store your files. Attached Flip-Top Lid Boxes prevent lost or damaged lids. Frequent access, heavy-duty boxes hold up under heavy use and can be stacked higher. Occasional access, medium-duty boxes hold up under moderate use and moderate stacking. Infrequent access, basic-duty boxes are suitable for basic use and lower stacking. Letter/legal boxes easily carry and accommodate both letter and legal size paper. Letter size boxes are perfect for high capacity letter size paper storage. Legal size boxes are 3” wider than letter boxes and accommodate legal document storage. True HEPA filter. This is a must-have feature for any air purifier purchase. This filter type safely removes 99.97% of airborne particles as small as 0.3 microns, including pollen, ragweed and other allergens, viruses, germs, dust mites, mold spores, pet dander and cigarette smoke. Selecting an air purifier with this filter ensures the highest performance for cleaning indoor air. Treated filters. If you are looking for extra clean air, you might look for HEPA filters with antimicrobial treatment. This provides built-in protection from the growth of odor-causing bacteria, mildew, and fungi on the True HEPA filter. Carbon filters. Though not necessarily cleaning the air, carbon filters are great for reducing household odors. It’s perfect for any location in the home where odors tend to occur regularly. Carbon filter air purifiers are especially great for a baby’s room air purifier where dirty diapers leave their trademark scent. You may want to look for an air purifier with both True HEPA and carbon filters in the same machine. Often air cleaners are selected based entirely on price. But this can be deceiving, and probably disappointing when you find out that your air purifier doesn’t seem to be performing as well as you thought. Smaller air purifiers may be less expensive, but may not clean the air in the room size you have at home. Be sure to measure the space where you want to use your air purifier so you can make the best choice in terms of air coverage. Filter change indicators are great to help maintain clean air filters without having to continually check inside the machine. An indicator light simply tells you when it is time to get a new filter. This feature is especially helpful for air purifiers that run continuously. Quiet performance. Allergy sufferers often run air purifiers while they sleep. An air purifier that runs quietly is essential for peaceful rest with cleaner air. Pet air purifiers. If you have pets, that means dander and odors are something you contend with daily. Pet air purifiers assist with cleaning the air of pet-related airborne particles.